Where does Toddler2Teen deliver speech and language therapy in South Devon? Toddler2Teen has opened a new service in South Devon for children who have speech and language difficulties. Speech and language therapy will be available in the Exeter, Torquay, Newton Abbot and Teignmouth areas. 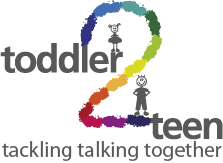 Toddler2Teen offers high quality speech and language therapy that is tailor-made for the needs of your child. Private Speech and Language Therapy Clinic in Newton Abbot, Devon. Appointments are available to book on most weekdays from 8.30 am to 12.30 and 1.30 to 4pm. Treatment Room 1 has been made available to Toddler2Teen speech and language therapy on Monday mornings. Other appointments are available by arrangement at your home or child's school. Please telephone 07712286261 to talk to Jenny Roder.